Children and grandchildren are now back to their own places. My home is now clean and tidy again, and here I am quilting and knitting again. As you can see on the picture, the weather here in Athens is very cold, we have snow for the second time since Christmas and it's the perfect weather for home activities. 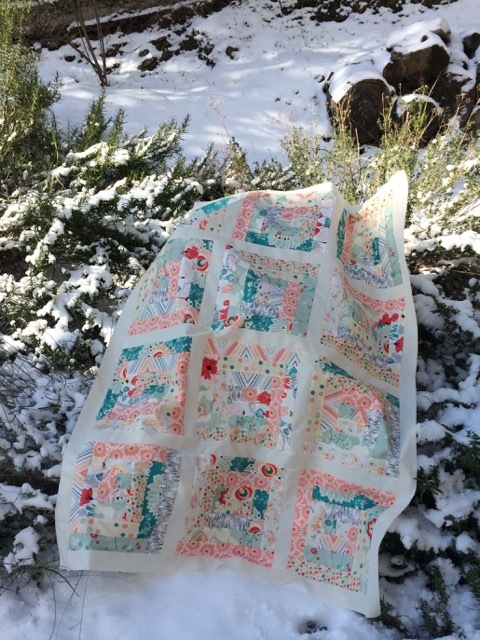 I enjoyed displaying my quilt on the snow to take a beautiful picture! This quilt top was done in a week-end time. 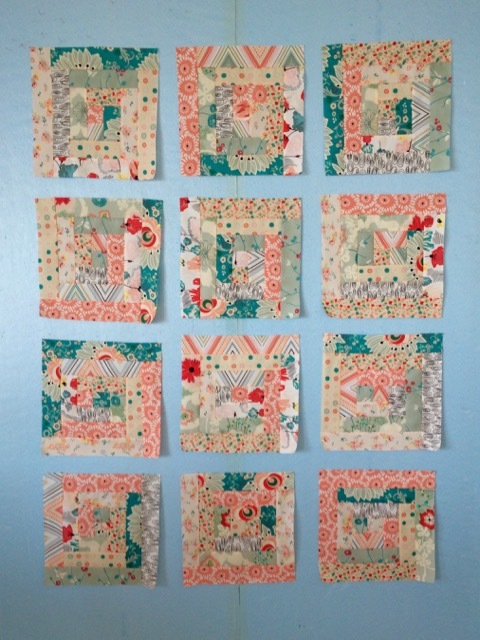 It is so easy and quick to sew Log cabin blocks following the method shown in MY TUTORIAL! Each finished block measures 10.5"x10.5"(26.67cm x 26.67cm). The top measures 38.5"x 50.5" (98cm x 128.27cm). To make this top I cut strips of 2"width, as I go along, not making any calculations either on the length or on how much fabric I need (too bad... or lazy in maths!). 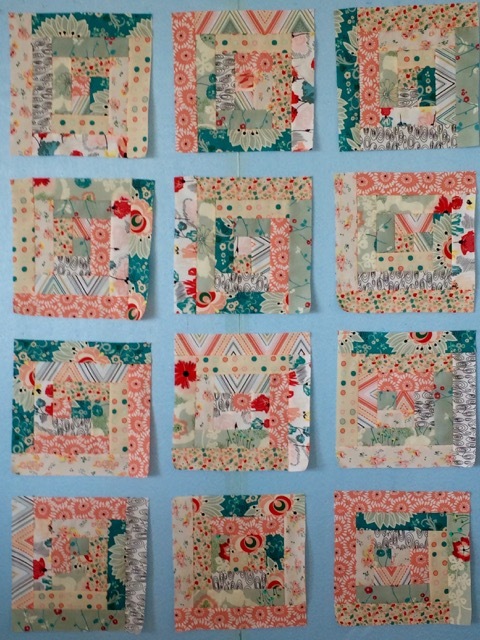 I chose fabrics from the line Rapture (Subtle Joy Palette) of Pat Bravo for Art Gallery. It's wonderful to see you and your beautiful work again! Your baby quilt is perfect, just enough fun with the white strips to give it some breathing room. Does this mean another baby is coming into your life? Best wishes for good health and joyful moments in the new year. 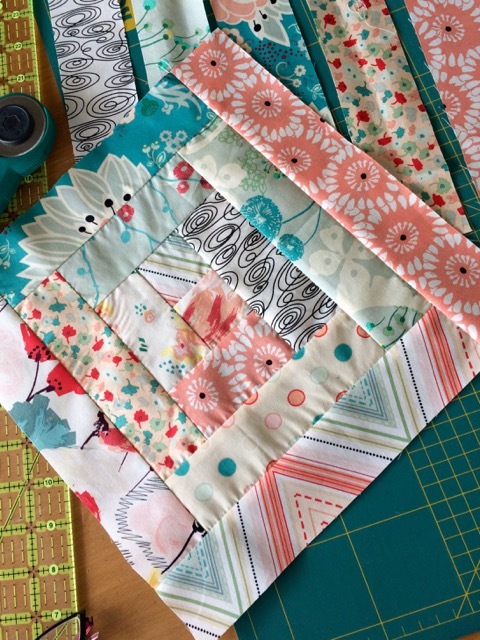 What a lovely fabrics for this baby quilt. Last night it also snowed in Sparti. Was beatiful at 8 in the morning. At 11 all the snow had melted again. That's so pretty, laid out in the snow like that! I'm just glad our snow is finally melting. Wonderful fabrics Christine, they are so soft and gentle. We are having a very humid day or two at the other end of the world, but I love seeing your photos of the snow in your garden. Your quilt looks lovely in the snow! I hope you are staying warm and cozy inside stitching. Happy new year to you! Beautiful blocks! I love Pat Bravo's fabrics! It is crazy - you have snow and in our part of the world we haven't seen any yet! I've been blessed to be busy with my granddaughter, too! Your quilt is lovely in the snow though it would be lovely anywhere. Very pretty! Very beautiful quilt! Love all the light floral prints. That's a perfect colour combination - such a pretty patchwork. I wish we could have some snow here in the south of England - would love to photograph some quilt with a snowy background! What a beautiful baby quilt! So lovely!! I will echo all the other comments with how much I love these colors! Beautiful log cabin quilt!